A very charming young man, yet pretty mysterious in the eyes of many, Raphael Desruisseaux entered the world of cosplay in 2010, under the name of "Bloody Funeral", and climbed up easily the ranks until he reached Master level within a single year. 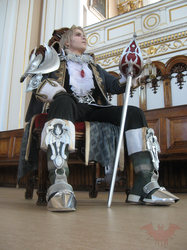 Winner of three "Best in Show" awards, he is reknown for his impressive vampiresque costumes from the Soul Calibur franchise, as well as for his incredible acting, under the persona of Raphael Sorel (coincidentally sharing the same first name). This cosplayer is part of those who do not make new costumes for each event. In fact, he is passionate about giving life to characters that are dear to him, while also considering all the minor details of the face, with different incarnations. He does not hesitate to remake projects time and time again, all while improving until he reaches complete satisfaction, doing all that he can with the ultimate goal of giving the impression of being the actual character in the real world. Appreciating all sorts of materials, Raphael has a penchant for all animal products, which he would then happily transform in order to create various armour and hallucinating accessories! Furthermore, he also works with latex and plastic to make his own facial prosthetics, making him unrecognizable, whether it be a zombie with a wolf trap embedded in his face, a vampire with a sharp glare, or even the adorable Super Mario."